Scooper - Technology News: Angus Deaton: Do we need to rethink the Robin Hood principle? Angus Deaton: Do we need to rethink the Robin Hood principle? International development aid is based on the Robin Hood principle: take from the rich and give to the poor. National development agencies, multilateral organizations, and NGOs currently transfer more than $135 billion a year from rich countries to poor countries with this idea in mind. A more formal term for the Robin Hood principle is “cosmopolitan prioritarianism,” an ethical rule that says we should think of everyone in the world in the same way, no matter where they live, and then focus help where it helps the most. Those who have less have priority over those who have more. This philosophy implicitly or explicitly guides the aid for economic development, aid for health, and aid for humanitarian emergencies. On its face, cosmopolitan prioritarianism makes sense. People in poor countries have needs that are more pressing, and price levels are much lower in poor countries, so that a dollar or euro goes twice or three times further than it does at home. Spending at home is not only more expensive, but it also goes to those who are already well off (at least relatively, judged by global standards), and so does less good. I have thought about and tried to measure global poverty for many years, and this guide has always seemed broadly right. But I currently find myself feeling increasingly unsure about it. Both facts and ethics pose problems. Huge strides have undoubtedly been made in reducing global poverty, more through growth and globalization than through aid from abroad. The number of poor people has fallen in the past 40 years from more than two billion to just under one billion – a remarkable feat, given the increase in world population and the long-term slowing of global economic growth, especially since 2008. 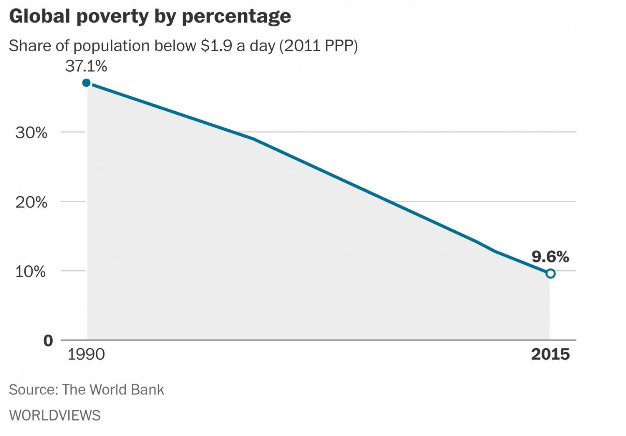 While impressive and wholly welcome, poverty reduction has not come without a cost. The globalization that has rescued so many in poor countries has harmed some people in rich countries, as factories and jobs migrated to where labor is cheaper. This seemed to be an ethically acceptable price to pay, because those who were losing were already so much wealthier (and healthier) than those who were gaining. A long-standing cause of discomfort is that those of us who make these judgments are not exactly well placed to assess the costs. Like many in academia and in the development industry, I am among globalization’s greatest beneficiaries – those who are able to sell our services in markets that are larger and richer than our parents could have dreamed of. Globalization is less splendid for those who not only don’t reap its benefits, but suffer from its impact. We have long known that less-educated and lower-income Americans, for example, have seen little economic gain for four decades, and that the bottom end of the US labor market can be a brutal environment. But just how badly are these Americans suffering from globalization? Are they much better off than the Asians now working in the factories that used to be in their hometowns? Most undoubtedly are. But several million Americans – black, white, and Hispanic – now live in households with per capita income of less than $2 a day , essentially the same standard that the World Bank uses to define destitution-level poverty in India or Africa. Finding shelter in the United States on that income is so difficult that $2-a-day poverty is almost certainly much worse in the US than $2-a-day poverty in India or Africa. Beyond that, America’s much-vaunted equality of opportunity is under threat. Towns and cities that have lost their factories to globalization have also lost their tax base and find it hard to maintain quality schools – the escape route for the next generation. Elite schools recruit the wealthy to pay their bills, and court minorities to redress centuries of discrimination; but this no doubt fosters resentment among the white working class, whose kids find no place in this brave new world. My own work with Anne Case reveals more signs of distress. We have documented a rising tide of “deaths of despair” among white non-Hispanics – from suicide, alcohol abuse, and accidental overdoses of prescription and illegal drugs. Overall death rates in the US were higher in 2015 than 2014, and life expectancy has fallen. We can argue about the measurement of material living standards, whether inflation is overstated and the rise in living standards understated, or whether schools are really that bad everywhere. But deaths are hard to explain away. Perhaps it is not so clear that the greatest needs are on the other side of the world. Citizenship comes with a set of rights and responsibilities that we do not share with those in other countries. Yet the “cosmopolitan” part of the ethical guideline ignores any special obligations we have toward our fellow citizens. We can think about these rights and obligations as a kind of mutual insurance contract: We refuse to tolerate certain kinds of inequality for our fellow citizens, and each of us has a responsibility to help – and a right to expect help – in the face of collective threats. These responsibilities do not invalidate or override our responsibilities to those who are suffering elsewhere in the world, but they do mean that if we judge only by material need, we risk leaving out important considerations. When citizens believe that the elite care more about those across the ocean than those across the train tracks, insurance has broken down, we divide into factions, and those who are left behind become angry and disillusioned with a politics that no longer serves them. We may not agree with the remedies that they seek, but we ignore their real grievances at their peril and ours.